For a Few Dollars More: Uncut for the First Time? Sergio Leone's western classic For a Few Dollars More (original title: Per qualche dollaro in più) starring Clint Eastwood, Lee van Cleef and Klaus Kinski was made back in 1965 and has never had an uncensored release worldwide. In 2007, the Italian distributor released a Blu-ray that features the most complete version of the movie to date. However, it is still missing a short scene which the British Blu-ray contains (but this release is censored differently, though). This situation could change for good on February 15th, 2013. 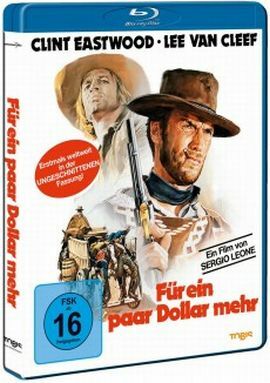 The German label Universum Film has announced a co-operation with Tobis Film and they advertise their upcoming DVD and Blu-ray as the first uncensored releases of For a Few Dollars More. Still, we remain a little sceptical since Universum just recently released a new edition of Flatfoot in Africa, which was praised as a longer-than-ever-before cut but turned out to be a cut version in the end. We'll see what's the case this time.